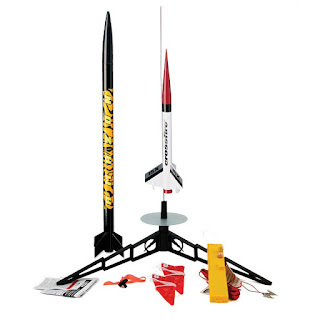 Here’s our selection of some of the best Estes easy to assemble model rockets. We’ve searched out the best prices on Estes E2X rockets so you don’t have to! Easy to assemble model rockets are ready to fly in no more than an hour or two, so there’s no waiting around before you can launch the latest rocket in your model rocket collection. Visit our store for the cheapest prices on the full range Estes model rockets and all the model rocket accessories you will ever need! 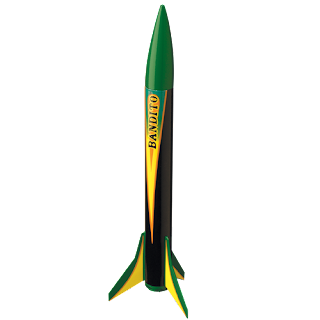 The Bandito is a sleek, cool looking Easy to Assemble Estes Model Rocket that will streak up to 600 feet in the air on Estes mini engines. 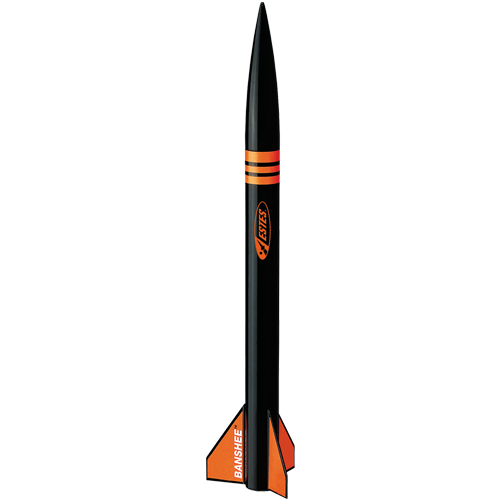 The fun is fast and furious with the Bandito E2X model rocket and it takes just under an hour to assemble. Set the sky on fire with the easy to assemble Firehawk E2X Model Rocket Kit. You could have this Estes Easy to Assemble rocket ready for launch in just thirty minutes. The Estes Firehawk will reach altitudes of 5000 feet on Estes mini engines. It’s an excellent model rocket for beginners and a great one to add to a model rocket collection. This classic Estes E2X model rocket is where many people have begun their model rocket hobby. The Easy to Assemble Alpha III only takes minutes to assemble; all you need is some glue. The Alpha III rocket will reach heights of over 1,000 feet on standard Estes engines. This is a timeless classic that deserves a place in any model rocket collection. To launch the Estes Alpha III you will need a launch system, model rocket engines, starters and recovery wadding, which are sold separately. Looking something a little bit different? 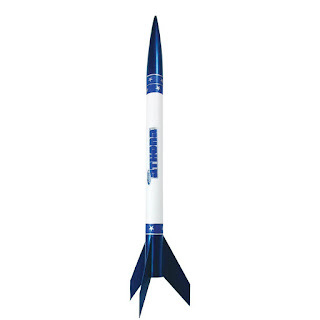 Then take a look at this cool looking Estes Sky Writer E2X Model Rocket Kit. The Estes Sky Writer model rocket kit only takes an hour to assemble and then it will soar an impressive 1,100 feet into the sky! The Estes Sky Twister Kit E2X is one cool model rocket and it’s the helicopter nose cone recovery that makes it really stand out from the crowd. The Sky Twister easy to assemble rocket will shoot up to 650 feet and then then body will glide down on a parachute and the nose cone will helicopter its way home! You'be gotta check this one out! 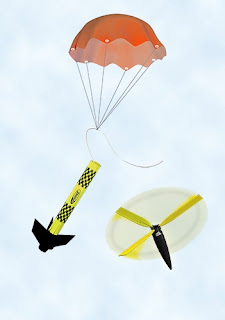 The Freefall is another Estes easy to assemble model rocket with a twist. This time it’s little parachute man that comes back down to earth separately from the rocket. The Estes Freefall is easy to assemble and it’s hours and hours of fun. On standard Estes engines, the Freefall E2X rocket will reach 575 feet! 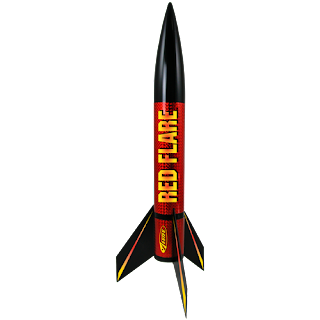 The Red Flare E2X model rocket comes with pre-colored plastic parts, so there’s no need for any painting at all and that means that you get more time flying it! 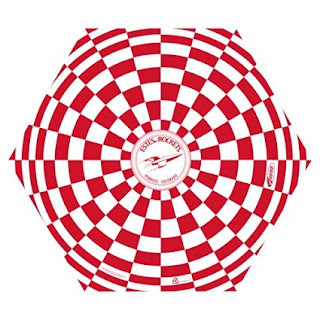 The Estes Red Flare Easy to Assemble rocket will reach heights of 1,000 feet and its eye-catching design is sure to attract some attention at the flying field! 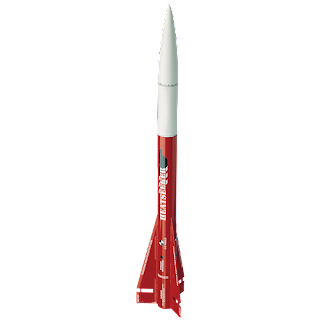 To launch the E2X Red Flare rocket you will need a launch system, model rocket engines, starters and recovery wadding,and Estes Maxi Launch Rod, which are sold separately. 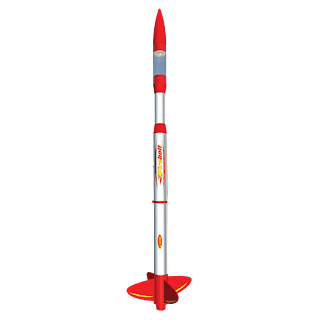 At more than 3 feet tall, the Estes easy to assemble Top Shot Model rocket is quite a sight to behold! It’s an easy to assemble high flyer and that’s for sure! The Top Shot E2X rocket will shoot up to 1,150 feet on an Estes E engine! This one is a must for any serious model rocket collection. 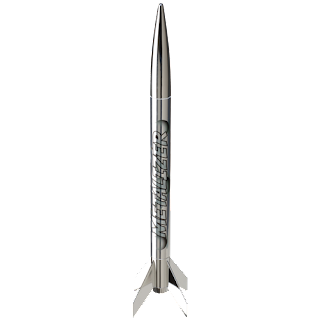 To launch the E2X Top Shot model rocket you will need a launch system, model rocket engines, starters and recovery wadding,and Estes Maxi Launch Rod, which are sold separately. The Estes Firebolt E2X model rocket stands at an impressive 26 inches tall and it as a transparent payload section for launching things into the sky. This is an almost ready to fly rocket that will definitely impress. 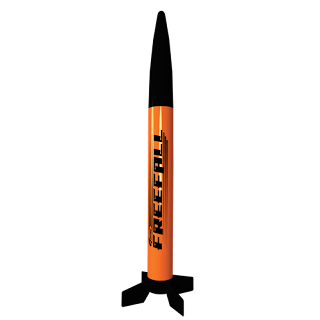 The Firebolt E2X rocket will soar as a high as 1,000 feet and then gently float back to earth on an 18 inch parachute. 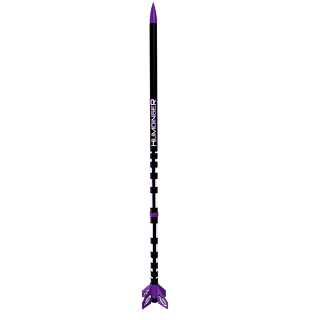 To launch the Estes Firebolt model rocket you will need a launch system, model rocket engines, starters and recovery wadding,and Estes Maxi Launch Rod, which are sold separately. *Requires Estes E Launch Controller and Porta-Pad E when launching E Engines - sold separately. Get creative with the Estes easy to assemble Generic model rocket. It comes in plain white, so you paint it, add the self-sticking decals, or just leave it plain white. 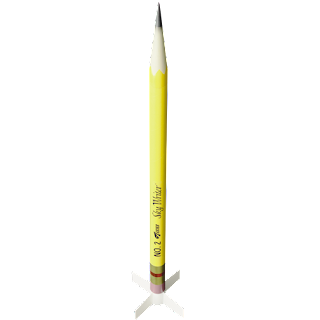 The E2X Generic may not be the best name that Estes have ever come with, but this easy to assemble rocket will still hit an altitude of 1,100 feet! 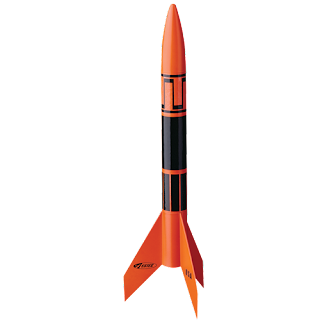 The Estes Banshee easy to assemble model rocket was a big hit in the 90s and Estes have brought it back to meet popular demand. The banshee E2X rocket needs no painting and it will take a couple of hours to assemble. Then, you’ll be ready to launch it up to an amazing 1,100 feet on standard Estes engines! The Estes AGM-57X Heatseeker almost ready to fly rocket always looks really cool on the launch pad, so it’s bound to generate a buzz on the flying field. The AGM-57X Heatseeker E2X won’t let you down in the sky either, because it will shoot its way up to a height of 875 feet on standard Estes rocket engines! The super slick, cool looking Estes Metalizer easy to assemble rocket will put on a dazzling display for you at the flying field. 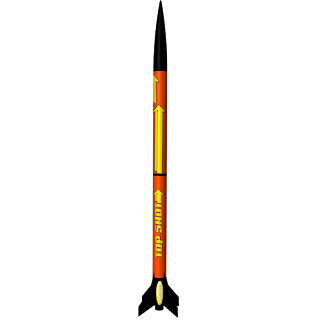 The metalizer E2X rocket will only take about an hour to assemble and then you’ll be ready to countdown to a launch that will send your rocket 750 feet into the sky! 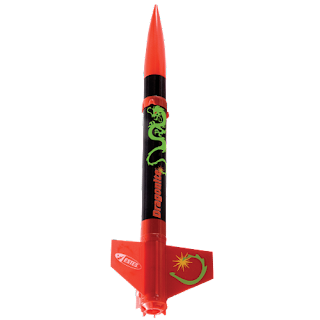 The Dragonite Easy to assemble model rocket is the latest addition to the Estes snap together range of rockets and that means that you can assemble your model rocket in a matter of minutes. Easy to assemble doesn’t mean poor performance with Este, though. The Dragonite R2X model rocket will soar up to ab impressive 1,100 feet on standard Estes engines! 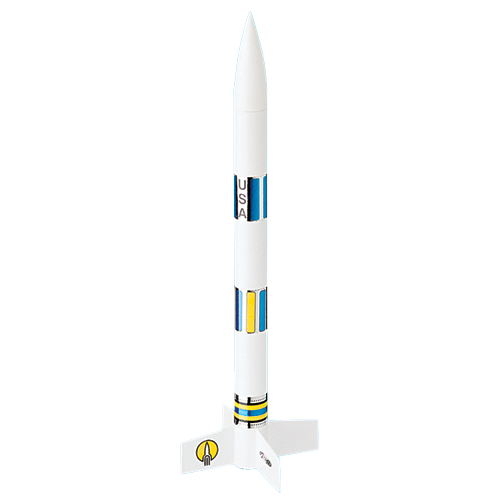 The Estes Shuttle Xpress E2X is a really cool model rocket that will only take about an hour to assemble. The Shuttle Xpress will shoot up to 575 feet where two fighter gliders will be released. The rocket will glide down on a parachute and the gliders will go on gliding for about 200 feet! The Estes Flip Flyer easy to assemble rocket will take about two hours to assemble and will reach an attitude of up to 900ft. The fun docent stop there! The Flip Flyer E2X model rocket has dual recovery. The rocket will come down on a heli-blade and the nose cone will descend on a parachute! 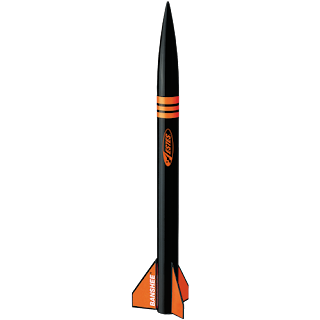 Fans of the Denver Broncos will love the Estes Orange Crush E2X model rocket! 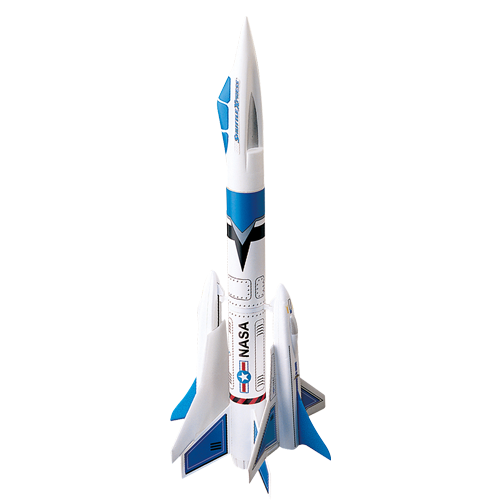 You can have this brightly coloured model rocket ready to fly in just two hours. 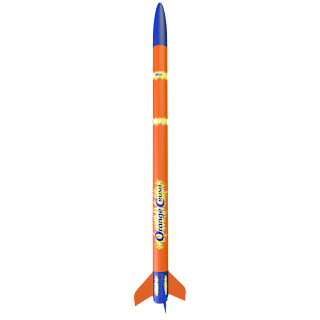 The Orange Crush easy to assemble rocket will soar up to an altitude of 850 feet! 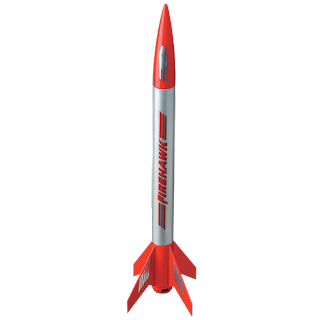 The Estes Humdinger easy to assemble model rocket is powered by mini engines, but it takes fun to the max! 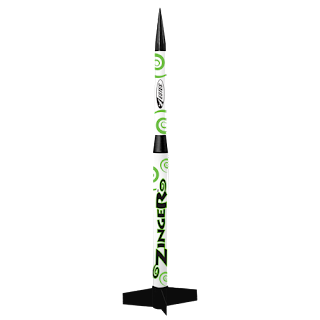 The Humdinger E2X model rocket is only .54 inches in diameter, but that won’t stop up soaring up to an altitude of 1,100 feet! The retro look Zinger E2X rocket is powered by Estes mini engines and It’s really easy to assemble. You can get flying quickly with the Estes Zinger easy to assemble model rocket and it will fly up to 500 feet on an Estes A10-3T engine! 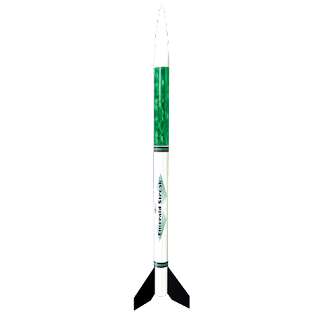 Standing at 22 inches tall, the Estes Emerald Streak is and easy to assemble model rocket that will make a great addition to your model rocket collection. 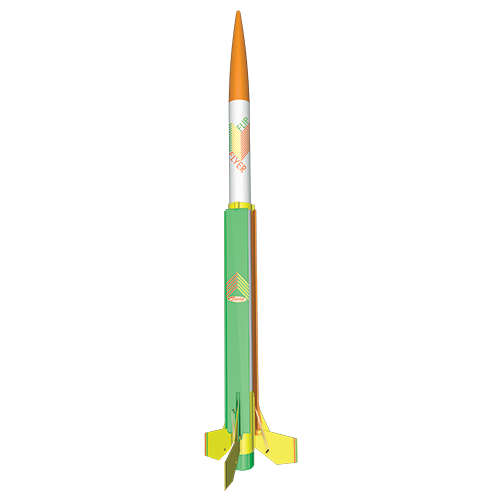 The Emerald Streak E2X rocket will streak up to around 900 feet and then gently float back to earth on a bright recovery parachute. Visit our Model Rocket Store for the cheapest prices on the full range Estes E2X rockets and model rocket accessories.